A small plane crashed on the northbound 101 Freeway in the Agoura Hills area on Tuesday afternoon, officials said. Crews responded to the highway north of Liberty Canyon Road just before 2 p.m., according to the L.A. County Fire Department. The pilot has been removed from the aircraft and did not sustain any injuries, the agency said. The plane, a vintage aircraft with camouflage paint coat, crashed toward the center divider. Footage from the scene shows firefighters extinguishing flames that consumed the body of the plane. No other vehicles were involved in the incident, the Fire Department said. Video shows traffic was backed up for miles on the northbound side of the 101. 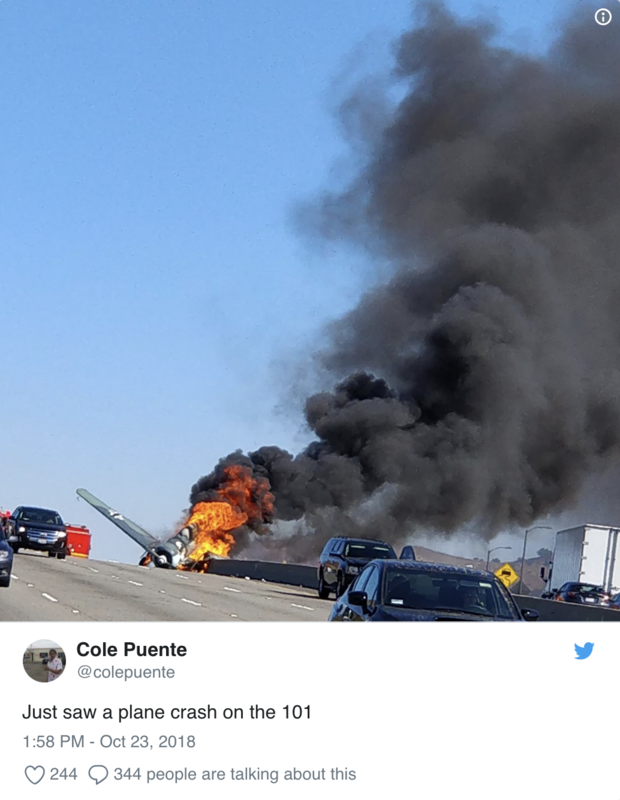 All eastbound and westbound lanes will be closed for an unknown duration, California Highway Patrol tweeted at 1:59 p.m.
KTLA’s Meghan McMonigle and Steve Granado contributed to this report.